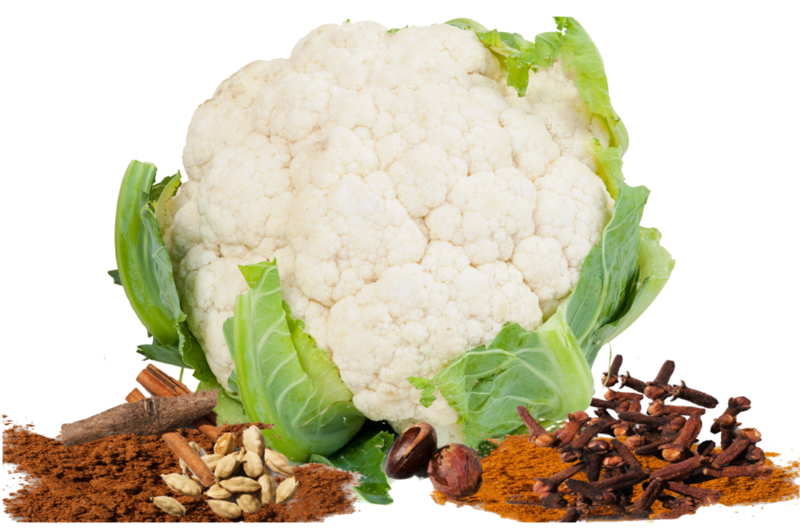 The diverse background of this dish is evident in its name; gopi is Hindi for ‘cauliflower’, while musallam is from Urdu, the language associated with the Muslims of Hindustan, abd means 'whole' or 'complete'. It is not a coincidence that the word musallam comes from the same root as ‘Islam’ or ‘Muslim’, which has similar connotations. The Islamic Mughal dynasty of the northern part of India introduced this dish, which has now become a dish enjoyed throughout the state. Rub the cauliflower with salt, turmeric and oil. Place the spiced cauliflower on an ovenproof tray and roast for 25 minutes or until tender. Remove the tray from the oven and set aside. Grind all the ingredients for the spice masala into a smooth paste. In a large, heavy bottom pan on medium-high heat, add the ghee, oil, and the spice paste. Cook, stirring constantly, until the paste turns lightly golden brown. Stir in the pureed tomatoes, tomato paste and milk until well mixed. Allow the spices and vegetables to simmer on a low heat for 8 minutes. Add the peas and stir well. Gently lay the whole cauliflower into the pan and baste with the prepared sauce. Cover the pan with a lid and cook for 5 minutes. Remove the lid and baste again, cooking for 10 more minutes with the lid off. Serve in a large bowl or platter, garnished with coriander leaves and nigella seeds. Gobi Musallam makes a stunning centerpiece for the dinner table and is perfect for sharing. Give everyone a large spoon and dig in, being sure to break the tender morsels of cauliflower off its stem. This dish is best accompanied with either a flaky paratha or a cucumber raita. You may substitute the cauliflower for a whole head of broccoli and cook it in the same way. You could substitute the cinnamon, nutmeg, cloves and cardamom spices with 1 teaspoon of Kashmiri Garam Masala.